Good morning and welcome to this weeks six on Saturday. it is a work weekend this week so as always this will be a quick one. We actually had rain fleetingly on Wednesday night and it has given the Gardens bit of a boost to say the least. I have managed at least an hour in the garden every night but my Hayfever is starting to kick in. At the moment I am writing this in front of a table full of medication. It’s my ears actually that giving me the most problem and I am having trouble breathing. I think it is the Hayfever that is causing this but not sure. 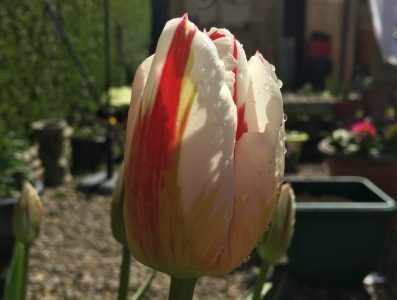 The sunny weather has really brought out the best in my Tulips. They have lasted for weeks and I have been delighted with them. The top 2 photo’s show Carnival de Rio and Blue Amiable. The bottom one shows Cairo and Ronaldo. I started planting this on February and I am really pleased with how it is turning out. I went a little bit heavy with the gravel but the Sedums, Sempervivum, Aeononiums and Saxifrage are loving it. In this picture we have Sedum Cape Blanco, Sedum Purple Emperor, Sedum Oreganum, a non descriptive Sempervivum . I have had this random plant flowering in my front garden during spring for years. A pretty plant with succulent leaves and yellow flowers. It has been puzzling me for years then it suddenly dawned on me. I had a Kalanchoe plant in my kitchen a few years ago and it was not doing much so for a laugh a planted it in my garden.. It’s not doing to bad for a plant that is native of Madagascar. Must be a tough cookie to have survived the beast from the east! On the east side of the garden I have a 10 ft night privet hedge. I believe this is the most important plant in the garden because it shelters the garden fro cold easterly winds and was very effective during the beast from the east. Sometimes the most simplest plants are the most important ones. The 2 Heuchera Red Sea and Heuchera Lime Marmalade. Tried a bit of an experiment end of last year and cut the red one back. I then read that you can just let them be as it is evergreen. I have expanded my collection this week and bought Fire Chief, Marmalade and …..
2 good flowerers from my Rhododendron collection. Starting to get a liking of Rhododendrons after my visit to Scotland. Will have to keep Ali’s on it though as running out of space I’m my garden. Turns out it’s not been just Hayfever giving me trouble with my breathing. Looks like my Cabin filter has not been changed during service since I got this work van. That’s my Six on Saturday. Full service will return next week. Glad you found the source of your breathing problems! Your garden is looking magnificent. The photos really give a sense of sunshine and growth. Those tulip combinations are stunning. I really can’t take any credit for the Tulip colour schemes. There was no planning. Thanks Ali. Your dry trough is looking good. I know someone who has got into growing sedums in a big way. He tells me that he’s got six inches of pea gravel over the soil underneath and he plants the sedums into the gravel and, in no time, they have rooted down into the soil to get the best of both worlds and thrive. So I doubt you can overdo the gravel. I never plan plant combinations for colour but find that even the eye-watering clashes actually look good. My car’s service schedule tells me to change the filters every other year but I do it every year and find it makes a real difference. I like your dry trough. I have emptied out our old butler’s sink which was a dinosaur garden last year and want to do something similar to yours this year. Except you planted yours up in February and I haven’t got round to it yet! That dry trough looks great. It’s a glorious way of showcasing little gems, isn’t it? Wow. Those rhododendrons are really lovely. And that filter…no wonder you weren’t breathing too well. Are your succulenst all frost hardy, or don’t you get frost where you are. Pretty new to this but some of the succulents I had last year were tender. I did however put them right beside the wall of the house. I am experimenting at the moment TBH. All succulents I buy don’t cost to much. I would never dream of keeping an expensive succulent outside. That dry trough has some of the same plants that are in my planter box downtown, but on a smaller and newer scale. I want to cut some of the house leeks back, but they look too rad to ruin. They always look too good to cut back! I am concerned that they will exceed the height limit. (We need to keep the trees up above seven feet – so no one bumps into them – and everything else low enough to not obstruct the view of the crosswalks. The planter boxes are on corners, right where the crosswalks are. Yeah House Leeks fascinate me. That is one of my pet hates when you are at a junction and the vegetation is to high for you to see what is coming. It annoys me when others do, so I really do not want to do it! Great six. I too love your trough! I need to sort mine out, it’s a lovely mess of Sempervivums and Saxifrage. Agree about privet protection. Thanks Tim it certainly is a good project. Keeps me interested. Lovely photos! I still haven’t planted my stack of troughs that I made last autumn! On the job list once the ground planting is done. Thanks for your comments. The trough is going from strength to strength..